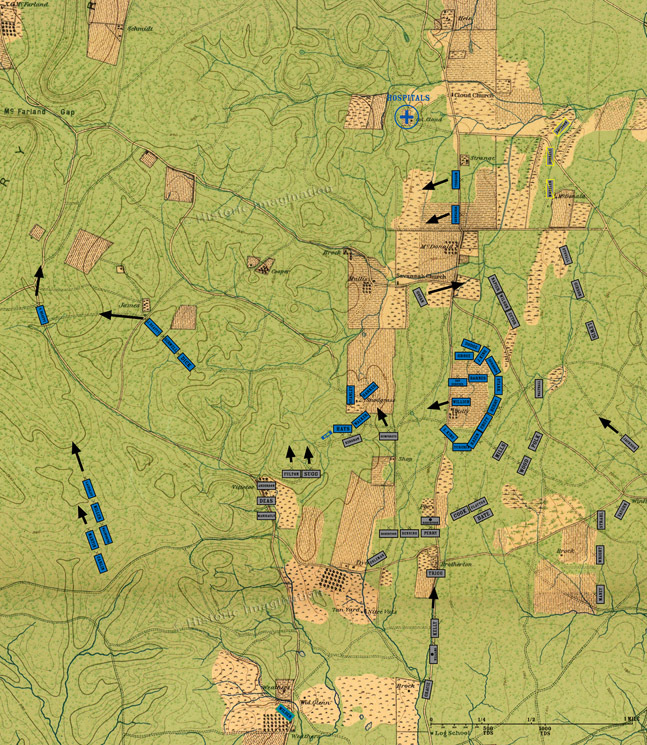 The divisions of Sheridan, Davis, and Negley’s force are marching toward McFarland Gap, away from the fighting. On Horseshoe Ridge, parts of Kershaw’s Brigade are attacking the ridge, while Johnson’s Division and Humphrey’s Brigade get into position. Near Kelly Field, the Federal Reserve Corps begins the last leg of its journey toward Snodgrass Hill, Govan’s brigade makes its way back to its lines, and Jackson’s Brigade moves to reinforce Hill’s Corps. Also, the Union forces in the salient adjust their lines, Barnes’ brigade moves to support Baird’s division, and Willich’s brigade tries to fill the gap between Kelly Field and Snodgrass Hill. Preston’s Division arrives near the Brotherton house and begins deploying in reserve. Hood's Division reforms south of the Poe house and deploys in a line supporting Robertson's Reserve Artillery battalion.